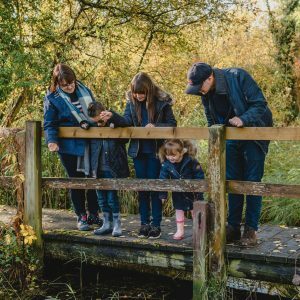 If you have a child under the age of five the chances are you will know all about Peppa Pig, her family & friends and the adventures they get up to. If you haven’t heard of Peppa Pig where have you been hiding? For those of you who know of whom I am talking about fancy a quick verse of the Bing Bong Song?? 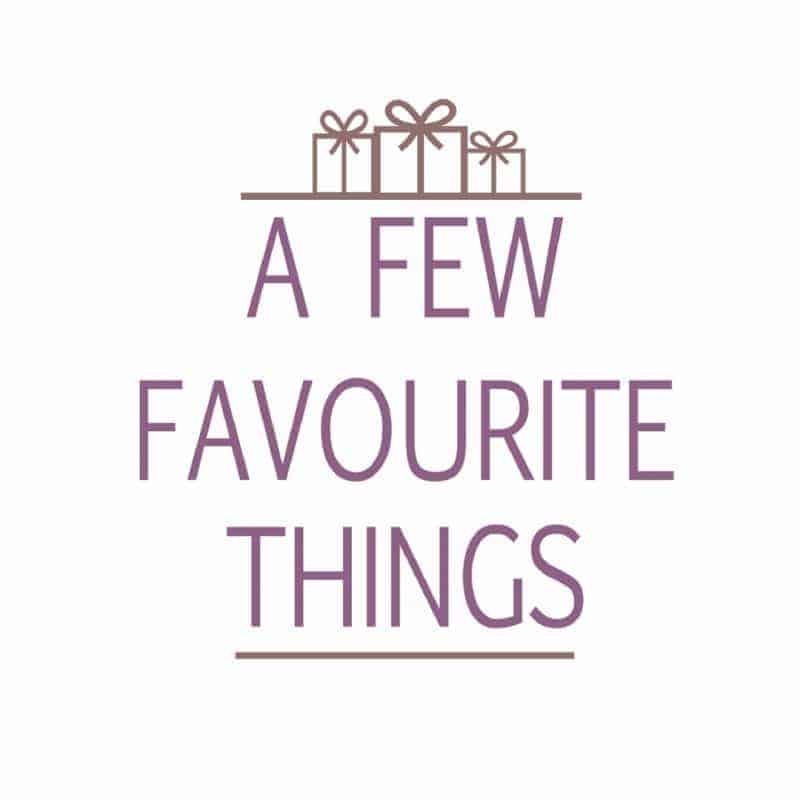 Alongside the incredibly popular television series there are a fabulous range of toys from KD UK. 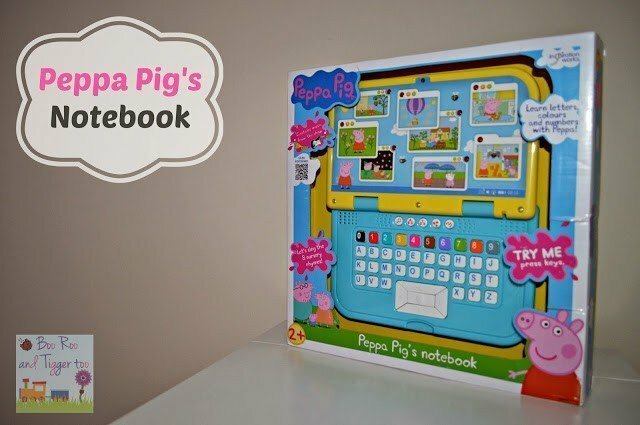 One of the products available is the Peppa Pig My First Notebook and Boo Roo and Tigger Too have been lucky enough to have one sent for to play with, enjoy and review. Opening the notebook for the first time you can see the attention detail that has gone into the product. The screen comes with eight different images on it with a little red LED light that dances around the screen next to each one. What I love is that they have really tried to make it as realistic as possible so have included some icons in the bottom right hand corner just like Mum and Dads computer may have. A notebook won’t be the same without a keyboard and mousepad just like Mum and Dads computer either. Instead of the traditional QWERTY keyboard layout that we are used to seeing they have simplified the keyboard buy having the letters in alphabetical order. The numbers are coloured, although number 2 I presume is supposed to be blue although looks more turquoise to me so maybe a little confusing to little ones. Discovery – Select an image with the direction keys and press the central squared key. Peppa Pig will describe this image and tell you the first letter of the elements. Also she will describe and tell you the quantities and colour of these elements. 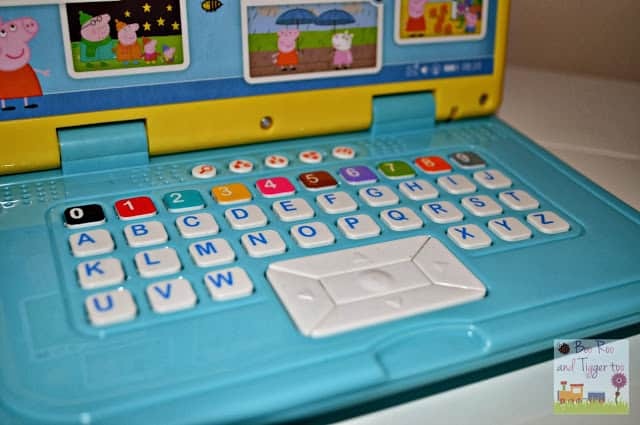 Letters – Peppa Pig will ask you to find a certain letter key or to find the first letter of one of the elements that are lighting up on the screen. You have three chances to press the correct answer key before Peppa Pig asks you a new question. Numbers – Peppa Pig will ask you to find a certain number key or to find the quantities of the elements that are lighting up on the screen. You have three chances to press the correct answer key before Peppa Pig asks you a new question. Colours – Peppa Pig will ask you to find a certain key or to find the colour of the elements that are lighting up on the screen. You have three chances to press the correct answer key before Peppa Pig asks you a new question. Music Time! 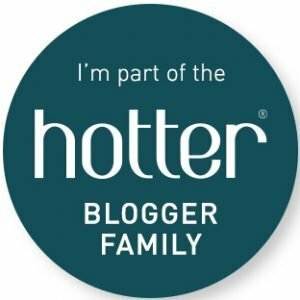 – Sing with Peppa Pig! Press any key to hear fun music. Press on the numbers or letter keys to create your own tunes. For Roo’s second birthday by mum bought her the Peppa Pig Fun Phonics and it is still going strong nearly 5 years later, so I was expecting great things from the Peppa Pig My First Notebook. I was not disappointed, the high standard of finish and durability has been applied to this product just as with the Fun Phonics toy. As the notebook is suitable for children 2yrs+ Tigger at nearly three had a little advantage when it came to playing with the notebook. As Tigger is confident with both his colours and numbers he managed to correctly answer those two games questions without much difficulty. The letters games, however he did struggle on. Whilst he can sing you the alphabet song he is not yet able to recognise the letters of the alphabet. This is where I feel the notebook comes into its own, allowing children as young as 2yrs interact with the notebook but still challenging older children right up to and including reception age. There is however two downsides to this product, firstly the inability to turn the product off, other than closing the notebook. It would be great to be able to practice numbers, letters and colours without Peppa Pig interacting to. 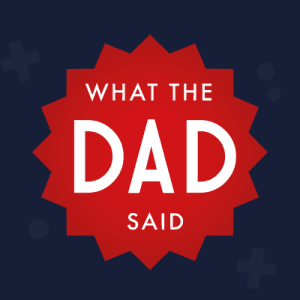 The other issue is like most toys the sound level, it would have been great to have been able to reduce the volume down as when a child first opens the notebook it can startle them a little. 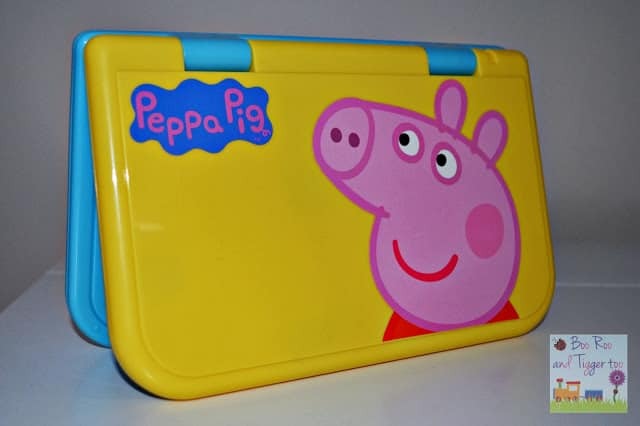 This are however minor things and don’t really take anything away from the educational and interactive value that the Peppa Pig Notebook offers. Disclosure Policy: We received the Peppa Pig’s My First Notebook FOC for the purpose of review.